For me, as a humanitarian, Greece is a special case. It’s a precedent and an opportunity for us to learn how to respond in these non-typical settings. Though many of the refugees are residing in camps, more and more are living in urban settings, particularly Athens. This context presents difficulties for traditional actors as beneficiaries are harder to reach, and being cost-effective (as measured by cost per beneficiary) is problematic. The context was not an ordinary emergency; the surrounding society functions well. There is infrastructure, well established government departments, administration and a sovereign government. But there are significant needs, without new and innovative solutions the Greek institutions struggle to adapt and cope with needs of vulnerable people. We don’t only see the usual suspects working on the ground. Instead, the refugee crisis in Europe triggered a wide response from many new actors. I would say the European civil society was in some cases quicker to respond than traditional humanitarian actors, leading to parallel response systems; governmental actors and the international humanitarian community in one corner, the local NGOs, and the grass-root ad hoc groups and individuals in another. Discussion and coordination between these were in many cases zero, especially initially. FCA as an organization was operating on the INGO level – but we found our contacts and understanding of the realities on the ground came through our local implementing partners. This leads me to my first point on the power of partnerships; local NGOs cooperate and gather information from the grassroots level in a way we as outsiders never could. Further, the local organizations were capable of navigating the messy Greek bureaucracy in an effective way. They already had the knowledge of the context and in many cases the capacity to respond. The challenge was how to direct those capacities to refugee response. We could offer that support, being a humanitarian organization with decades of experience of previous responses. We should trust the local actors and put more effort in raising their capacity. We should avoid self-implementation particularly when we work in a context such as Greece where the local capacity already exists. This is the only way to make sure we leave a lasting structure when we leave. This is particularly important given that it is possible Greece will be witnessing a new refugee influx at some stage, should political realities alter. The international support may not be available at that time, so we must ensure to the greatest possible extent that the structures we leave behind are up to the task. This is the approach we took, by investing as much as possible in the capacity building of our local partners. 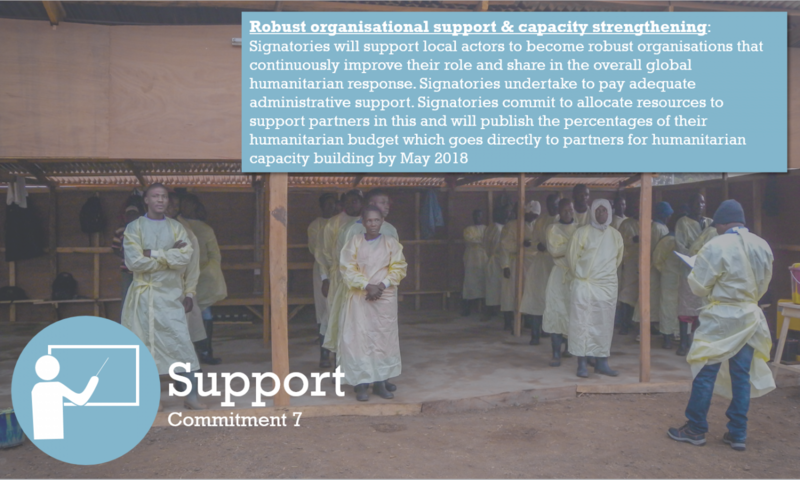 We should be more committed to this on a systemic level; it is much easier to secure funding for operations than capacity building of the local actors and making sure they have the resources for necessary support functions is often challenging. Though life-saving actions should naturally be prioritized, donors should also be willing to allocate resources ensuring the sustainability of the response in a long run. Another new thing in Greece is that since the crisis happens in a European context the solutions and offered services must be also appropriate for Europe. Our main focus since Autumn 2017 has been youth from 15 to 24 years old. This segment is marginalized within the already vulnerable group. They face discrimination and are outside of established social safety nets. Yet they are supposed to be able to make a living in a country they don’t know, that suffers from a serious financial crisis. Our response was to offer all our services to both refugees and the host community members and to focus on non-formal education activities that offer marketable skills that’ll hopefully help the refugees to integrate into the society and find a job. Our program does not consist of traditional humanitarian activities; instead we organize computational classes, plan on doing business skills trainings and will train refugees to become yoga instructors. We’re on untested grounds and as an organization do not have the capacity to organize such activities on our own. In case of computational thinking this has led us to seek partnership with an organization that does not have expertise in humanitarian work. They’re a network of 30 Greek universities advocating for open data. Through them we’re capable of offering courses that teach young people critical 21st century skills such as coding and web design. What we offer is the understanding of humanitarian work, access to donors and our knowledge of education in emergencies. The results are promising and we are positive that when we exit Greece they’ll have the capacity to continue without us. Within local communities there is often very sophisticated thinking on solutions to problems but they lack the resources sometimes to put their ideas into practice. One of FCA’s strengths is to treat local orgs not as contractors but autonomous orgs that have expertise and with respect. We also learn a lot from working with them. To sum it up, I see the power in partnerships in a very concrete way; by linking up with the right actor we are capable of offering more sophisticated and effective services than if we’d be working on our own. Through our capacity building efforts the knowledge stays in the country even after we left. Through working with partners we get the local buy-in and our fingers are on the pulse, meaning we can be sure our response targets the right people with right kinds of services. This approach may not be the easiest one, but it is a path worth walking if we want to respond effectively to a new kind of a humanitarian context such as one we’re witnessing in Greece.